Stealth Air, OPTEC USA's latest spinal brace in the Stealth line, will soon be available as our newest L-0631 PDAC-approved brace. The new one-size-fits-all adjustability feature allows you to reduce in-house inventory, thereby dramatically reducing cost. 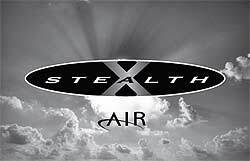 Stealth Air also features built-in anterior panels and is supplied with arthritic grips for geriatric patients. 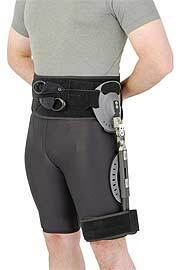 The brace has no bulk underneath clothing; is made of comfortable, breathable fabric; and has a tear-resistant compression system. 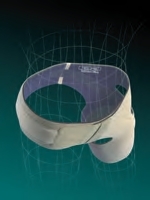 Orthomerica® Products is pleased to introduce a new addition to the Newport® hip line-the Newport lite™. 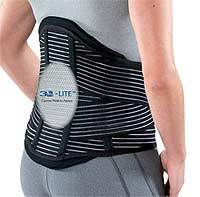 The Newport lite complements the existing Newport 3 and Newport 4 by providing protection and support for patients at risk for hip instability-related problems. The Newport lite is indicated for minimally invasive hip procedures and posterior hamstring repairs, and offers effective ROM control following primary or hip revision surgery. The Newport lite's comfortable, lightweight design is well tolerated by patients, resulting in improved patient compliance. The Newport lite is universal for the right or left side; one size fits most. 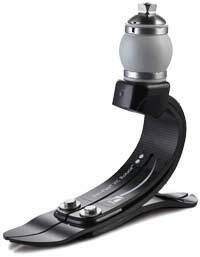 The Aeris Performance foot system improves upon the successful foundation of the Ibex foot from Emotis. 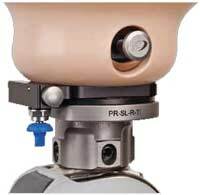 The Aeris Performance foot uses compliant composite technology (CCT) with multiple springs to increase the range of flexibility. 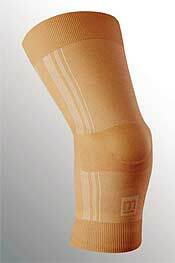 The result is a unique advanced energy release (AER) pylon design composed of nested parallel springs that enable the foot to react in a compliant manner at heel strike, then work together to create a dynamic push-off at toe release. The independent spring action provides smooth, stable progression while increasing the axial rotation, minimizing the forces transmitted to the residual limb. 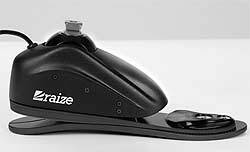 The Raize is a unique microprocessor-controlled hydraulic ankle/composite foot system in a low-profile, lightweight design. Its plantarflexion/dorsiflexion range reduces damaging forces on the residual limb and greatly enhances stability on slopes and slippery surfaces. By simply pressing a button, the wearer can control rollover resistance, lock or unlock the ankle, and adjust the heel height. Terrain accommodation aids gait on inclines and declines. 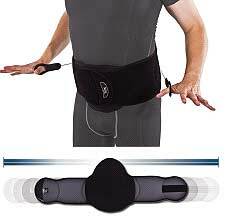 Simulates natural ankle movement and reduces shock. Remote ankle lock for driving and for donning shoes and socks. Intuitive computer interface for initial setup by a prosthetist. 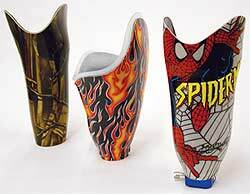 Arizona AFO now offers a line of high-quality, custom functional and accommodative foot orthotics in a variety of materials and constructions. Our designs incorporate various top cover and extension options, shell modifications, padding, and accommodations—all included in the price of the device! 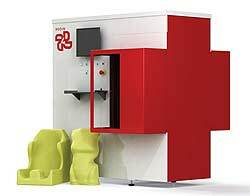 Practitioners may send crush boxes with an accompanying work order or digital files from our exclusive ScanCast 3D System. Find out more about this and other exciting new products by visiting our website. SYMBIONIC LEG by Össur. Move Naturally. 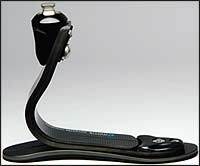 The SYMBIONIC LEG™ is the first commercially available, complete bionic leg that combines an MPK and a powered microprocessor ankle. 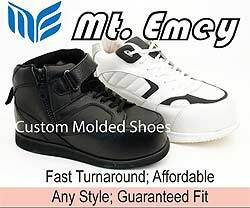 It provides unmatched toe clearance for enhanced safety and enables transfemoral amputees to confidently traverse terrain they might otherwise avoid, without the gait deviations commonly seen in MPK users. 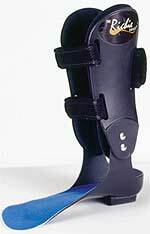 The SYMBIONIC LEG is insurance billable using existing, approved L-Codes and, when used with RHEOLOGIC Workbench software, offers the ability to document actual user cadence variation to reduce insurance reimbursement risk. 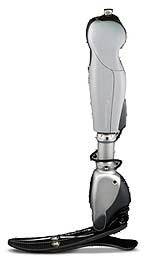 Call Össur to learn more about the SYMBIONIC LEG. 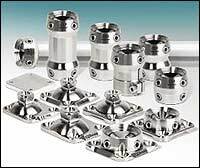 Prosthetic Design Inc. features in-house fabrication of elevated vacuum and traditional transfemoral and transtibial sockets, with many types of components specially engineered for both the practitioner and the patient. 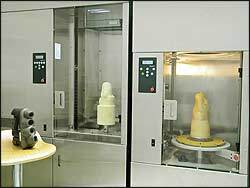 We use state-of-the-art, 3D CAD/CAM software to provide anything from foam carvings to check sockets to definitive sockets using your required specifications. In addition to using 3D CAD/CAM software to quickly design or modify limb shapes, the materials we use have been chosen because they offer the top quality, strength, and durability that you and your patients expect. Cascade Orthopedic is proud to offer the new Vari-Flex® XC Rotate™, which combines smooth rollover, excellent rotation, and shock absorption to meet the daily demands of the moderate- to high-activity user. Central to the Vari-Flex XC Rotate is the respected torsion cell that makes turning easier while helping to reduce rotary forces on the knee joint and shear forces on the residual limb. The dual carbon keel lessens the impact of vertical forces, while the EVO feature within the foot cover helps to enhance stance control and rollover motion to boost overall walking comfort. WillowWood's custom fabrication team provides high-quality craftsmanship and prompt turnaround for prosthetic fabrication jobs. Our custom fabrication department offers a full range of services, including check sockets, single- and double-wall socket laminations, and sockets with a flexible liner and laminated frame. Skilled in both traditional and CAD/CAM workflows, WillowWood's custom fabrication team has the best turnaround in the industry. Casts and CAD files (OMEGA® and AOP) are accepted. Same-day shipping is available on BK and AK check sockets for orders received before noon ET. Maximum turnaround for more complex fabrication jobs is four days.